Synopsis:(From Amazon)#1 Bestseller in Fantasy Anthologies and Dark Fantasy! Seventeen magical stories from NY Timesand USA Today bestsellers and award-winning authors that will entice you to the darker side of faerie tales. More Grimm than Disney, in this collection you’ll find twists on Snow White, Hansel & Gretel, Rumpelstiltskin, The Snow Queen, Cinderella, The Pied Piper, Alice in Wonderland, and Red Riding Hood, plus new tales paying homage to the old traditions. Yarrow, Sturdy and Bright was quite well done. It had excellent motifs and upheld what one would expect from a fairy tale. It was quite enjoyable. “Take the silver dagger. Carry the copper lantern. Wear a cloak the color of blood.” This is an interesting epilogue style retelling of a tale, where the reader learns that all they thought the knew about the original story was off, and the reader cannot help but want Yarrow to succeed, for her own happiness, and that of her town. The premise of this story is quite nice. I love the tie in between the name Tatiana for a Snow Queen story when mixed with faerie magic. There were some parts that were repetitive, “earned it and more” used twice as well as some general editorial/grammatical mishaps: “that didn’t mattered.” The imagery of the Snow Queen’s lair would have been more gripping if it hadn’t been compared to the Novodevichy Convent and had instead been linked to something most readers would recognize and understand– like a hockey rink. Bones was an interesting read, and had a few good morals within, including: sometimes it is better to keep to the path and not try to run off and that if you get what you want by force it usually doesn’t end up being as soothing and perfect as you had hoped for. This wasn’t exactly a retelling but moreso a tale written in the same style as many traditional faerie tales. I very much enjoyed this retelling of Cinderella. It’s nice to see a retelling in which Cindy believes herself to be a victim, but that things are hard on her stepmother and step-siblings too, whether or not she sees it. I liked that Cindy is a typical teenage girl, and that this story showed how easily manipulated someone who is in a state of turmoil can be. I didn’t like that the stepmother was constantly stamping her feet. I found it jarring as most people don’t go stomping around when angry, and there are much better ways to show irritation and displeasure. There were a few lines that were a bit hard to read and a few times where things were said instead of shown/experienced, but overall it was quite a good story. I love this. I absolutely love it. I would have bought the entire book just for this one short story. Sometimes, all you need is to believe in yourself and let everything else fade away. Or is that it? I can’t say much about this one except that it is perfection, and I clearly adore it. No Gift of Words jolts a reader into a new world, and doesn’t do a great job of making it an easy to understand place. The names were jarring and hard to get used to, and there was no basis of time as it seemed to jump forward without explanation. Although there is a small moral of being nice to all creatures, overall, this one wasn’t as well done as the others, predominantly because of the disconnect between the reader and what time period/culture you are supposed to be in. Had the author taken more time to make the land/culture accessible, it may have been more enjoyable. The Grim Brother is very well done. I quite enjoyed the first person narrative about what can happen when one is not quite as good as everyone seems to think. This is definitely worth the read, especially for people who love faerie tale retellings. I love Beauty and the Beast. I’ve mentioned before that it’s my favourite faerie tale and had been for quite some time. This story, however, fell hard and flat. 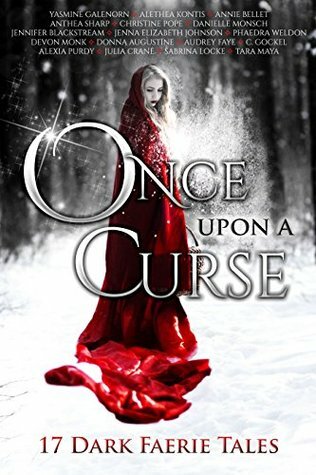 There was really no relation between this story and any faerie tale, and it feels like the author used the idea of a connection between this story and a fairy tale to get traction, as she appears to be planning to do for her series that this story starts. In one particular part of this story the author uses uncommon vocabulary, which is jarring since the story is, for all intents and purposes a modern story written in common vernacular. Not a fan. If you are going to skip a story, this one isn’t a bad one to consider skipping. The story itself was alright, but could have been greatly condensed– probably to a few pages. There is a lot of fighting and a lot of insulting but no basis for it in the beginning. The story, even as the situation started to be explained, dragged. It was a trudge to read this, in part because the vocabulary used was never explained, and you were expected to already know what the author was talking about. Don’t bother trying to use the kindle dictionary to look up the words– they aren’t in there. Drawn to the Brink is a great telling of something like a faerie tale, without actually being one. I really did enjoy this story, though it did have a small bit of grammatical issues. There is a lack of romance in this story, which makes it even more interesting and entertaining. While I definitely think this is worth the read, and I quite enjoyed it, I couldn’t help but think that the premise might have been entirely inspired by The Paper Magician by Charlie N. Holmberg. This story is quite different in the use of magic, and quite enjoyable. I highly recommend Holmberg’s novel series to anyone who enjoys this short story. The Variance Court is quite interesting. I expected there to be some sort of romance or connection between our protagonist and the man she got the ring from, and was quite disappointed in what the ring was ultimately used for. I think that the story had great promise, and it was squandered on trying to mesh it with an already existing story instead of doing something new and different and going its own way. The Morrigan is epic! There’s a lot of Celtic/Irish language and culture mentioned but it’s explained in a way that draws the reader in and makes it understandable. I liked that there was mention of the common myths that most people know, and how folklore has the information wrong, which is, “how we like it.” Imagine being grabbed from regular everyday life and finding that you are an extraordinary leprechaun! This is definitely worth the read! I enjoyed that Alice isn’t the girl we thought she was, but the shift in her relationship with the Red Queen makes the story difficult to get behind. The tie in of twins was excellent, but I would have much preferred that the twin the Red Queen had wasn’t Alice, as Alice has a particular personality that this short story doesn’t have the time or depth to rewrite. I thought that this was a very interesting story, but perhaps not the best or most well done. It was definitely a twist on the original Red Riding Hood story, but what Red is supposed to be is never fully explained, and what she was in the woods was also never explained. In many ways this story seems like the ramblings of an insane woman… but maybe that’s the point. The Final Straw was a very cute story. I enjoyed the use of supernatural creatures and the explanation of what Rumpelstiltskin is. There isn’t much I disliked about this story, nor can I say too much without giving the plot away. The Unicorn Hunter showcases the vulnerability and stupidity of a young girl who doesn’t know anything and wants to trust anyone. I liked the antagonist more than I liked her. Snow White did seem to grow at the end, perhaps, so their is hope that maybe someday she’ll be a great queen. TL;DR: Of the 17 I strongly recommend reading Yarrow, Sturdy and Bright, Magic After Midnight, Dance With the Devil, The Grim Brother, Drawn to the Brink, The Morrigan, and The Final Straw. 7 out of 17 isn’t bad! For more information on any of the authors, click the link next to their name and you’ll get to their amazon page. Sabrina Locke does not appear to have an Amazon page, which is why there is no link for her.